Graphs at a glance: Who's afraid of the big bad bankers? Apparently, the regulator. 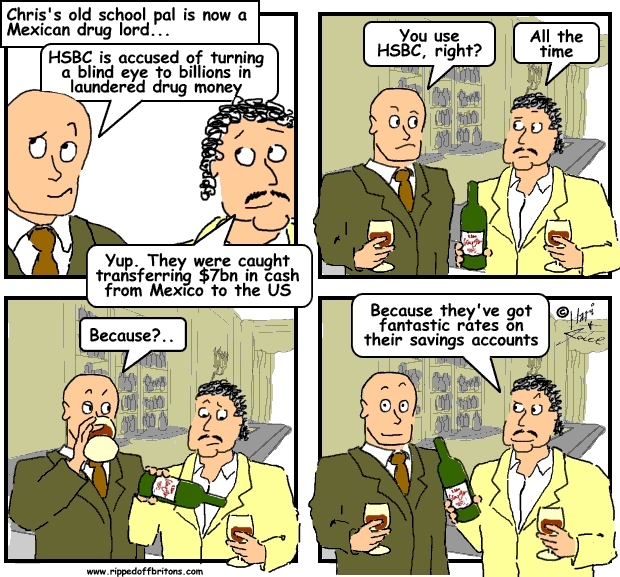 According to the Guardian newspaper between 2009 and 2013 banks paid £166 billion in fines and compensation for sins ranging from LIBOR fixing, to PPI mis-selling, to money laundering, to gold price fixing, et cetera. This figure doesn't include fines from 2014 onward including FOREX fixing et cetera. 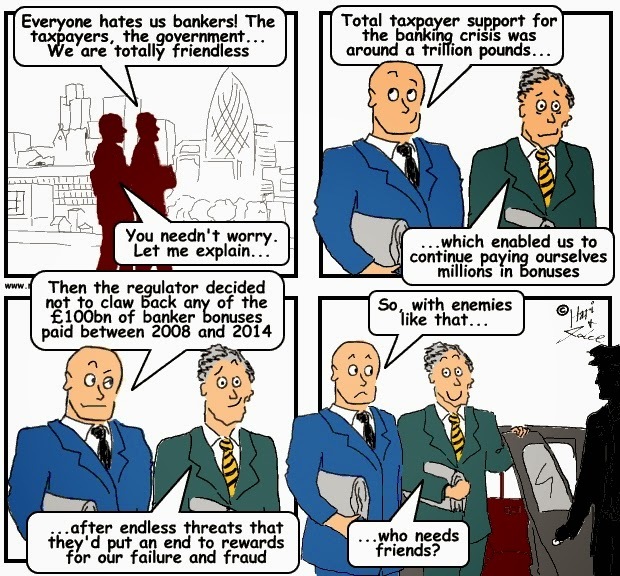 According to the Office for National Statistics £136 billion was paid in bonuses to UK staff in the financial services sector between 2004 and 2013, when much of the dodgy dealing was being done. After all the tough talk of 'clawing back' banker bonuses, what happened? The UK's financial watchdog the Prudential Regulation Authority (PRA) bravely decided clawback would only apply to bonus awards made from 1st January 2015! "many firms would not have the capacity to introduce such a requirement into existing employment contracts without employee consent and/or might be open to challenge for doing so. In order to ensure a consistent and even application of the clawback requirement across industry, the final rule requires the application of clawback only to awards made on or after 1 January 2015." The PRA couldn't impose bonus clawbacks because the bankers didn't want to give the bonuses back. "The remediation programme will require firms to review their systems and controls and policies and procedures in relation to their spot FX business to ensure that they are of a sufficiently high standard to effectively manage the risks faced by the business." 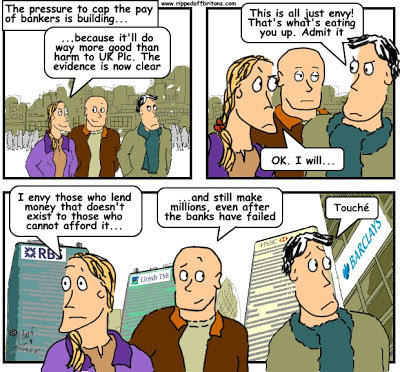 In its analysis of 'root causes' the FCA does not mention bad bankers. Which sounds rather like advice for a failing school. It is right that schools must seek "systems and controls and policies and procedures" to understand and help the most wayward children rather than simply punish them with lines and detentions. Bankers are not children. The most wayward bankers do need lines (i.e. 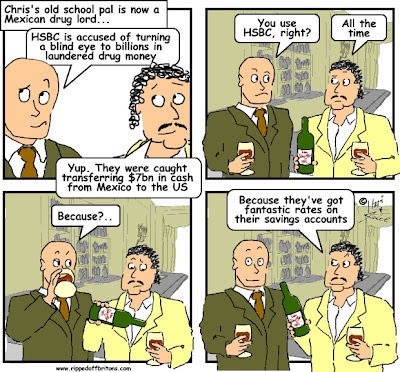 writing cheques to return their bonuses) and lengthy detentions (i.e. jail time). If the UK authorities still think new "systems and controls and policies and procedures" will prevent the bankers behaving badly, they are wilfully mistaken. "Between 1 January 2008 and 15 October 2013, ineffective controls at the Banks allowed G10 spot FX traders to put their Banks’ interests ahead of those of their clients, other market participants and the wider UK financial system. The Banks failed to manage obvious risks around confidentiality, conflicts of interest and trading conduct." 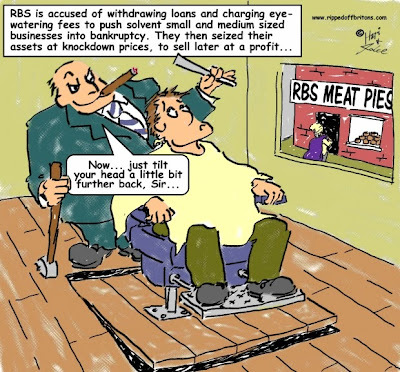 You will have noticed this particular period started AFTER the great banking crash, and continued for a year AFTER banks had been caught out with their LIBOR rigging shenanigans. Evidently there were no lessons learned, and no new systems, controls, policies nor procedures that made any difference. Q103 Ian Swales [MP]: How many of the schemes you have marketed are now illegal? Aiden James [tax consultant]: Most of them. Q110 Stephen Barclay [MP]: The model, if I am understanding correctly, Mr James, is that most of the schemes that you introduce get closed down within a relatively short period of time. So long as people are offered massive rewards with no real personal risk they will without a shadow of a doubt find a way to beat the "systems and controls and policies and procedures". Reduce the reward: eliminate bumper pay. Increase the risk: go to jail. The reality: George Osborne spent yet more taxpayer money paying for lawyers to fight the EU cap on, you guessed it, banker bonuses! • Distorted incentives in banking gave large rewards for short-term success, incentivising risk on the balance sheet." "The final provisions on clawback (of paid variable remuneration) and deferral (of unpaid variable remuneration) will apply to variable remuneration awarded for performance periods beginning on or after 1 January 2016"